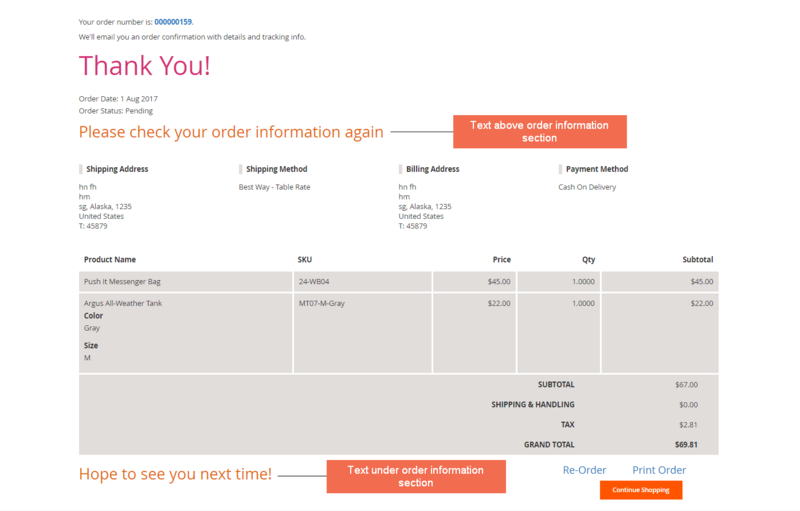 Magento 2 Order Details on Success Page extension shows all order information on the Thank you page after finishing checkout. In default Magento 2, the “Thank you” page appearing at the end of checking out process only shows order number and some notices, so that customers can not check their order information on this page. Order Details on Success Page is an extension for Magento 2 that allows you to display all order detailed information on the thank you page for your customers. If you want to add more content to your thank you page and make it more informative and attractive, you can consider another module of BSSCommerce Checkout Success Page for Magento 2. With Order Details on Success Page for Magento 2, the ordered product and order information containing Shipping address, Shipping method, Billing address, Payment method, order number, order status and the date of order are all shown on the Thank you page. Besides, the default features like print order and reorder are also presented. Order Details on Success Page for Magento 2 allows admins to text a ‘thank you’ message and change the size and color for this message. It will be shown like a title of the success page, which helps you express your thanks to your customers. Another useful feature of Order Details on Success Page for Magento 2 is that you can add text either above or below the order details on “Thank you page”. In text input fields, you can edit any content that you want it to be shown on the thank you page and also set size and color for this text message. Why Order Details on Success Page for Magento 2 is your must-have extension? Instead of showing some simple information in default Magento 2, Order Details on Success Page for Magento 2 extension shows all order information on Thank you page. Customers can verify their information again to make sure that they are all exact and in case of having mistakes, customers can fix them timely, which helps you reduce significantly the number of error orders. By adding the Thank you message, text above and below the order details on the success page, you can express your regards and more information about the order, therefore, customers will have much sympathy for your store. This module works very well. I am very satisfied with the support service of BSSCommerce even though this is a free extension. I will consider Magento 2 Checkout Success Page extension that you recommend, it seems to be a good extension for Magento 2 success page, too.